I am happy to say that I am now with my second guide dog. The process to building a relationship with a guide dog and learning to work with a different guide can be a challenging one. There are many things that happen on training and it can be intense. I am going to walk you through my training and how I was feeling during training. Photo Description: black lab sitting with the silhouette of his handler Ashley behind him. I arrived on Sunday and got settled, it was a long travel day but I was so excited to be arriving at class and to get started training. I never slept much the night before I left and I certainly did not sleep with the excitement that on Monday there would be a knock on my door; and my second guide dog would be on the other side. After the knock on the door and my guide dog came in the room, it was real and I knew I could finally take a deep breath because I was going to have a harness handle in my hand again. It is a lot of emotions, excitement, happiness, gratitude, but a little fear as well. This dog doesn’t know me, he has never worked for me, will he like me? Will we work well together? Can I learn to work with him without comparing him to my last guide dog? Photo Description:: Woman sitting on a couch wearing a hooded sweatshirt and sun glasses while a black lab lays at her feet sleeping on a white dog bed. We started the process of learning our guide dogs, getting to know them and helping them to get to know us. Healing them and doing some obedience and easing into guide work. I really enjoyed the slow ease into the guide work so that when I did pick up the handle I knew him a little better, he knew me a little better. On our first walk together it felt amazing to have a harness handle in my hand and walk down the street with confidence (well a little bit of confidence) and know that this was the start to an amazing partnership. The first week was amazing and exhausting. It is long days and lots of learning. We worked in the mall, in a park, on the sidewalks, lighted crossings, uncontrolled crossings, audible crossings, coffee shops, buses and so much more. We were also given the opportunity to attend the National Remembrance Day Service in Ottawa which was amazing. With it being the 100 year anniversary of WWI and 100 years of CNIB. 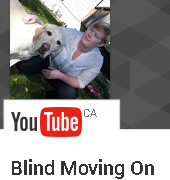 Especially since guide dogs and the CNIB came out of the WWI. My guide dog did amazing in the thousands of people, the gun shots, the cold, and even with the fly over. It was an overwhelming experience for me and him but we supported each other and it was a great feeling. Photo Description: Woman wearing a blue sweatshirt and jean sitting on the floor with a black lab laying between her legs on a white dog bed while she uses a roller to give him a massage. There really are not words for how it feels to work with a guide dog and the bond that builds each and every day as you learn to trust each other fully. I am on cloud 9 this whole week while at the same time being so scared. It is a life changing few weeks that is for sure. The one thing that makes all the difference when you are in class and training with a new dog and feeling all sorts of emotions, is having an amazing team behind you. With the CNIB Guide Dog program I had the best team ever behind me and that makes all the difference. Stay tuned for week 2 and 3! I have a CNIB guide dog puppy that will be leaving me in January. It is so great to get a peek into the other side when she leaves me. I hope you and Danson can work together for a very long time. They are wonderful beautiful souls these dogs. I will be following your story. Stay safe!